I bought a 12v compressor after seeing good reviews on here. What's this fitting it came with then? I'm more familiar with the left-hand two - PCL and Euro(?) 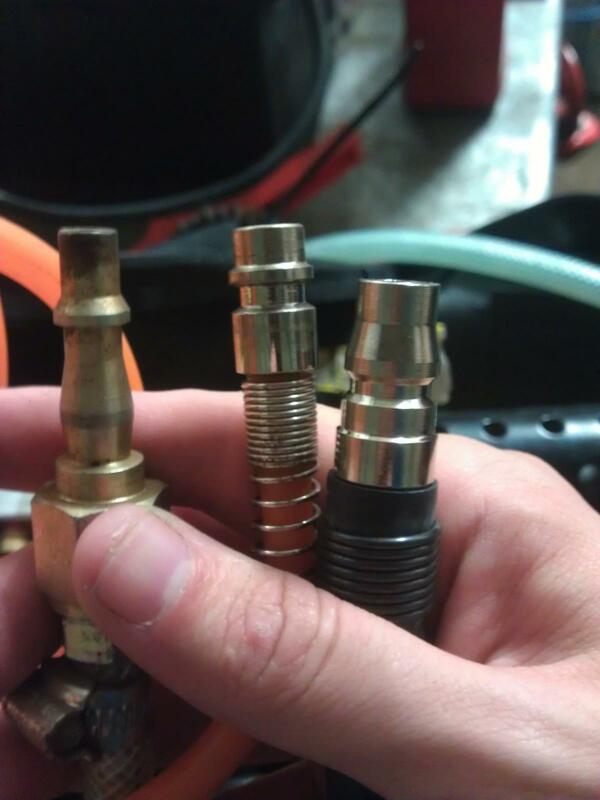 fittings - but the one on the right came with the compressor and doesn't fit anything else I've got. Ditto above(!) Was tempted to cut it off and stick on PCL. Thanks guys, I'll need to buy/make a converter. I unscrewed the union from the compressor and its *very* slightly larger than 1/4 BSP. Might be NPT. Basicly the american version of BSP. Correction - it's slightly SMALLER than 1/4 BSP - I'll head down to Pirtek or similar and get an adaptor I think, so I can convert it to 1/4BSP and use a PCL fitting. Is it a 12mm metric fitting? I'd looked at that but didn't unscrew it because I'd assumed the tube was important for cooling as well as convenient packaging. However, if it saves me buying another fitting... I'll have another look when I get home from work. 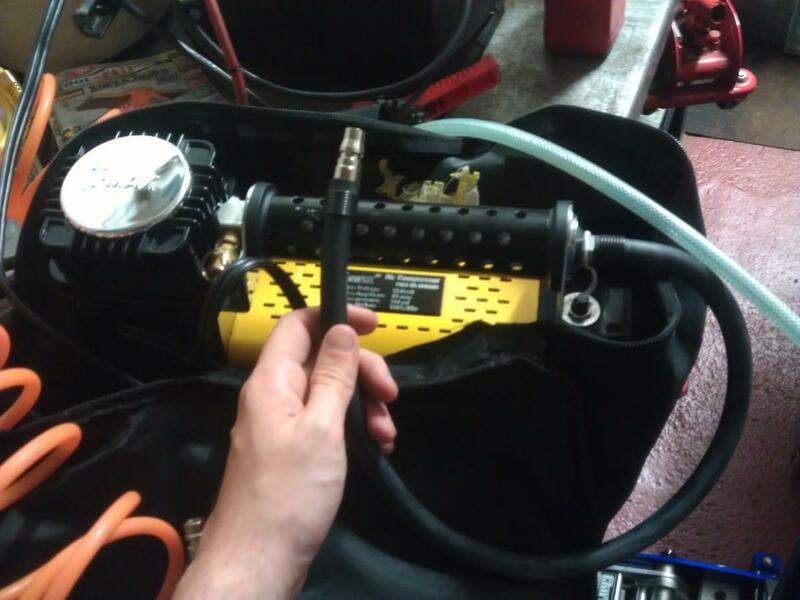 Mark - does your compressor look the same as mine, because I unscrewed that tube (how much sealant?!?) and mine ain't 1/4"BSP inside. I've now dismantled the whole thing and I'll take the remnants to Pirtek or similar tomorrow to get an adaptor. 4: 1/4"BSP fitting from Machine Mart: 12.75mm OD, 1.25mm plus half a thread in every 6 = 18.8 threads per inch. Should be 19 threads per inch - near enough. Any clues what 1, 2 or 3 might be? I guess 1 & 2 are probably the same within the margin of my measuring error (which is good because it'd mean I can keep the safety valve, which sounds attractive). 3. will be 12mm x 1.25 mm. 1 and 2 will be the same thread... Are they tapered? 13.73 is 540 thou and that rings a bell in my head for a thread size, cant remember what it is though!! It could well be a UNF thread. at risk of sounding daft and not knowing what i am talking about, does anyone know of a way/supplier/somebody looking for beer tokens in post, of a way to change out the current awful screw on fitting onto tyre valve on t max unit to the nice type that you push on and flip lever to lock (dont know name) that would mean it just gets posted to me? Watch this thread carefully for a few more days and I should have reached a solution with all the information you need to order and plug in anything from a tyre inflator to a spray gun! It's hard to see if they're tapered or not, I've only got five or six threads to work with. It was bad enough trying to measure the pitch! They do look suspiciously metric though, lets hope my diameters were a little way out and I can find a fitting to make it all work. very possible with it being a comercial fitting but it'd be a sloppy fit... Almost like i made it. Pirtek were unable to identify the threads, not M12/M14 because neither would screw on. 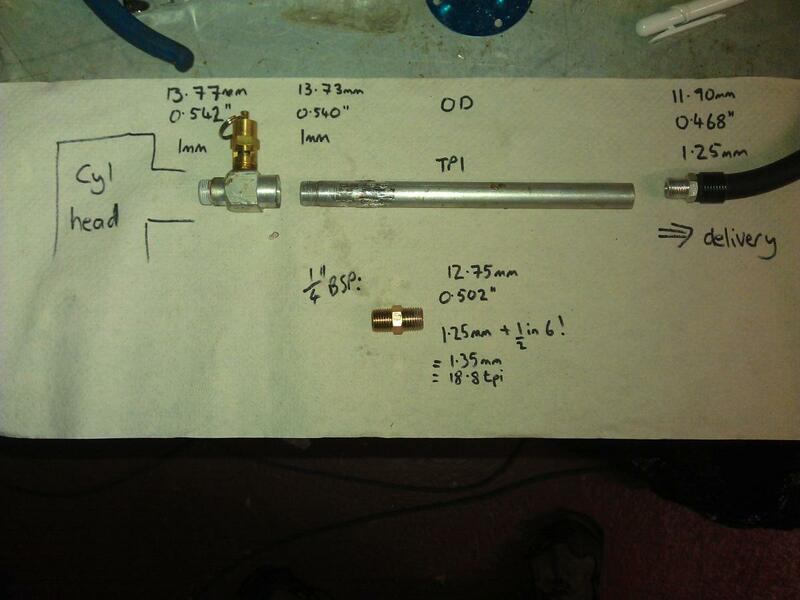 So I took the simplest route, bought a firtree fitting and cut the rubber hose. It's about 8 or 9mm ID, but I've wrapped tape around the 6mm firtree I bought and it works ok. A complicated route to a homebrew solution when I was hoping it'd work straight off the shelf. It's giving >100psi against a blind pipe and holds 50psi pumping into a tyre at 30psi. In due course I'll get an airtank and a pressure switch but, for now, it's adequate for tyres and airbeds. I have a T-Max and it too had the awful screw-on fitting. 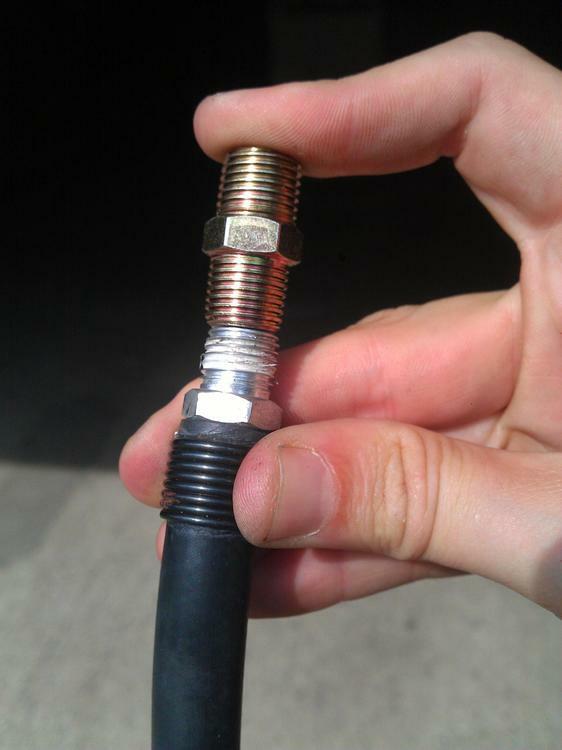 I recently bough a lance type fitting (like on petrol station air pumps) and a suitable barb adaptor to fit into the rubber hose that the screw-in valve is attached to. It works perfectly and cost me just over $10 to get the parts at a US tools shop, so it isn't expensive.